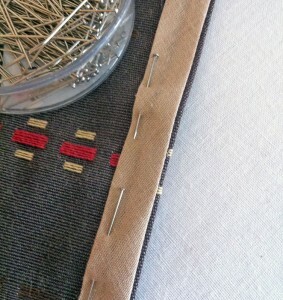 Knowing how to attach bias binding is such a useful technique and gives a really decorative and professional finish to lots of simple craft projects. 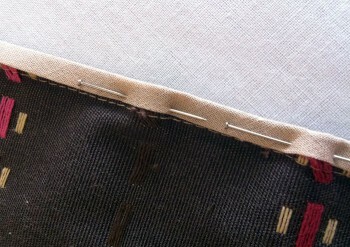 This kind of binding is sometimes used to finish the seam allowance of some really bulky, easily frayed, fabrics such as towelling. It does take a bit of time and patience but it is definitely worth the effort. The hand finishing in this method is very therapeutic after a long hectic day and the results make it a double reward. 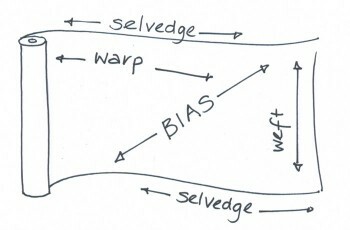 Firstly, what does bias mean? 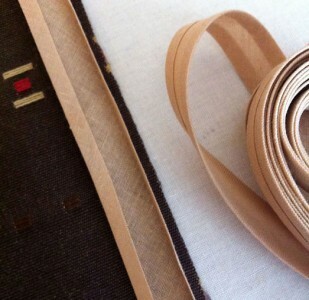 So bias binding is a strip of fabric cut on the bias and used to bind a cut edge. Fabric cut on the bias stretches slightly and although this means that it needs to be handled carefully-it also means that it can bind curved or shaped edges without pleating. For a long time bias binding has only been available in plain colours, and if you wanted something a little bit more exciting or absolutely co-ordinating to your garment fabric,-you had to cut your own-(nightmare! but we will show you one day very soon). Now however, bias binding is starting to be supplied in patterns such as gingham or spots as well as floral prints (and yes!! the-stitchery has got hold of some and it’s gorgeous-blink and you’ll miss it!! Open out the fold along one edge of the binding and place it right sides together on the edge to be bound with the raw edges matching. 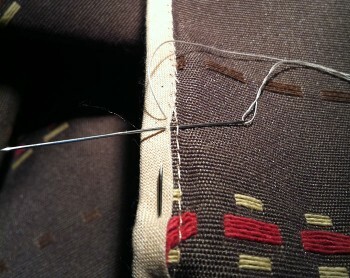 Machine straight stitch along the fold line removing the pins as you go. Fold the binding around the raw edge to the wrong side of the fabric. If you don’t want the binding to show on the right side (for example on the hem of a skirt) – fold the binding back on the stitching line effectively creating a narrow facing. If you want a narrow decorative border fold on the centre of the binding and bring an equal width of binding around to the wrong side. The last fold on the long edge remains folded under. Stretch the bias binding around outward curves or ease it to fit an inward curve and pin into place. Tacking a curved edge may well be advisable. 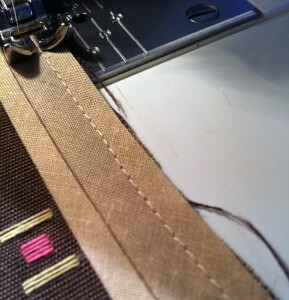 To complete this binding technique by machine, stitch close to the folded edge on the wrong side removing pins as you work. 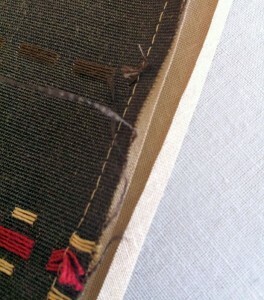 Be careful to ensure that your stitching is in the same place on the first side of the binding. 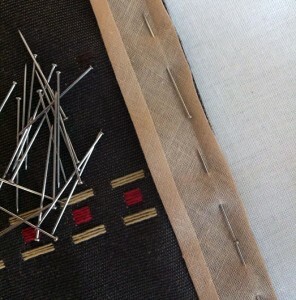 If you want a controlled hand finish – for example on a curved edge-or you don’t want a top-stitched look, it might pay to complete this technique by hand. To do this, slipstitch the folded edge of the binding on the wrong side and pick up every machine stitch from the first row of machining that you used to join the bias binding. 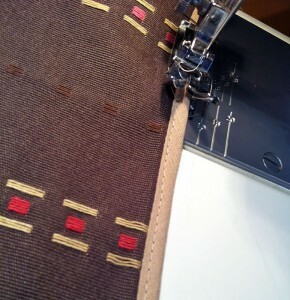 This keeps your hand-stitching very neat and very precise and gives your work an couturier level finish.